Leighton Buzzard still need four points from their final two games to avoid a shock relegation after losing to Northampton Old Scouts on Saturday. In a much improved performance from their showing earlier this season, Old Scouts leapfrogged Buzzard in the standings after their comfortable 45-17 win. 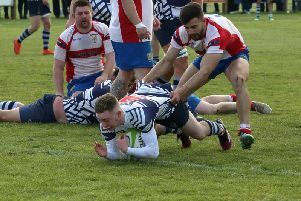 The results leaves Leighton 11th in the league, staring nervously over their shoulders at the relegation zone, needing four points to ensure Midland 1 East rugby for the fifth consecutive year next season. Old Scouts kicked off on a dry afternoon with Buzzards having the slight advantage of the cross-wind. In the first minute Scouts strong runners put the Buzzard defence under pressure but slowly Leighton worked their way into the game and it was a surprise when the home side opened the scoring after nine minutes with a converted try to lead 7-0. It took Buzzards five minutes to reply. With the Leighton lineout performing well – a penalty was kicked to the corner and the Buzzard pack drove over for captain Michael Lynch to touch down to leave the score 7-5. A five minute spell in the middle of the half gifted Old Scouts two tries – firstly an over-ambitious Buzzard pass deep in their territory hit an Old Scouts players head and bounced kindly for their second try. Shortly afterwards a missed tackle on a rushed defence opened up the Buzzard line. With both tries converted Old Scouts led 21-5. Despite these setbacks, Buzzards continued to create opportunities and, with the last play of the half, a delicate chip to the corner from Jack Whitehouse gave James Brett the chance to score in the corner. With the difficult conversion missed Buzzards trailed 21-10 at half time. Buzzards started the second half with much more tempo to their game but the home side quickly scored twice – their strong runners were breaking tackles and were backed by good support. Both tries were converted to make the score 35-10, with 28 minutes to play. However, from the restart Buzzards were awarded a penalty forty metres out - Euan Irwin took a quick tap and almost made the line himself. Although stopped a metre out, the recycled ball was passed to Dan Baroux who scored by the posts. Ollie Taylor converted to make the score 35-17. With 25 minutes left Buzzards needed one further try for a bonus point but, despite their efforts, the next 20 minutes were pointless. The home side added two further tries in the last three minutes as a weary Leighton side tried in vain for the extra point and in doing so gave a slightly unrepresentative feel to the final score at 45-17. Next week, Leighton take on fifth placed Old Northamptonians in their final game of the season at Wrights Meadow in a bid to stave off relegation.